Starting our recap of the second live-action Superman serial, released two years after the first. This is about as pure a sequel as you are ever likely to see, produced by largely the same cast and crew (with Kirk Alyn once again uncredited as Superman), with music and special effects recycled from the old serial. Some of the incidental music cues from the "Batman and Robin" serial are also used. Chapter 1, "Superman Flies Again," opens with a crime wave terrorizing the city. A group of thugs are surprised while robbing a war surplus depot. Two of them hold off the cops while a third uses a radio to call for help. Who ya gonna call? Lex Luthor. Luthor uses a special machine to cause fiery flares to shoot from the building, distracting the cops long enough for the thugs to escape. At the Daily Planet, the old gang is still together. The cast hasn't changed a bit, though Lois is now sporting shorter hair. They discuss Superman's arch-enemy, Lex Luthor. Perry White doesn't believe Luthor's involved in the recent crime wave, though. "I still believe Superman scared him away"
Clark Kent, who is the first of many through the years to exhibit a problem remembering how to pronounce Luthor's name, says that if it is Luthor, he won't be able to keep from bragging about himself. And literally seconds later, Luthor's on the radio, threatening to destroy Metropolis unless he is paid a huge ransom. He says he'll destroy a bridge first, as a demonstration of his power. Perry sends his reporters out to get a story, then has trouble finding a match to light his cigar (we'll see this gag a lot). So Lois and Jimmy head out to the bridge, where we see stock footage of the real Tacoma Narrows Bridge swinging in the wind. Lois points and says a woman has driven onto the bridge, at which Jimmy replies, "Typical woman driver," then we cut to stock footage of a car on the road. but is now also intercutting close-ups of Kirk Alyn with smoke blowing past him to simulate flying. 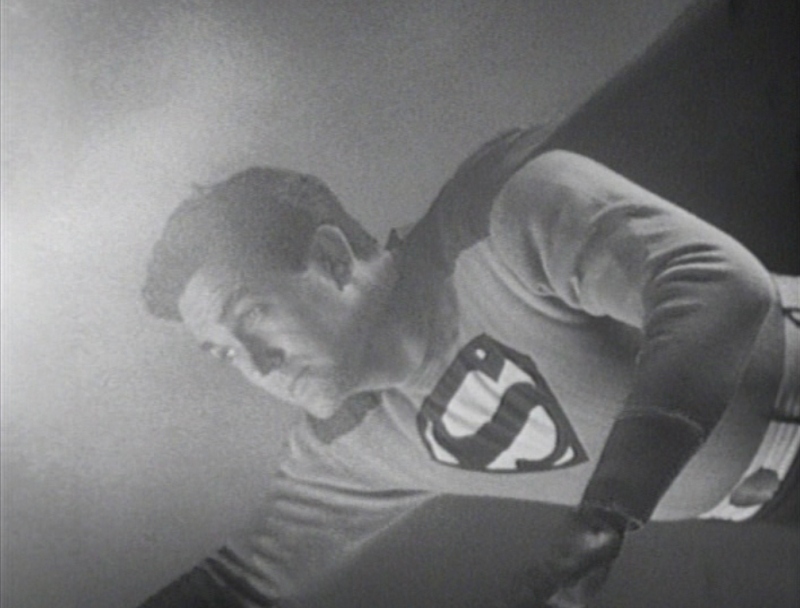 Supeman stops the bridge's swaying long enough for the woman to be rescued (an effect accomplished by simply stopping the film in mid-swing, then cutting to Superman with his hands braced against a stone wall), then uses his super-hearing to trace the ultrasonic waves to Luthor's hideout. Moments later, he has captured the mad scientist. It's ten minutes in, and Luthor has lost. Now what the hell are we supposed to do for 14 1/2 chapters? Luckily, a new crime wave starts once Luthor's in jail. Jimmy Olsen, sent to cover a fire, catches a crook running out of the burning building. The crook pulls out a distinctive coin and disappears. 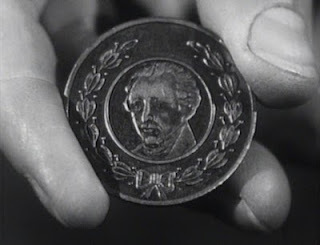 The next day, convicted killer Lawson, on his way to the state pen, pulls out a similar coin and also disappears. 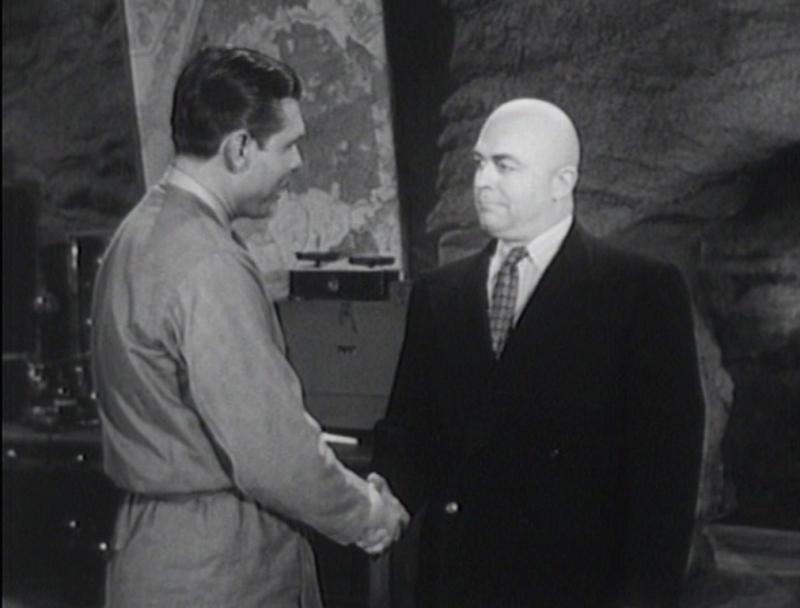 Clark suspects Luthor's hand in this, but Luthor is still in the penitentiary. However, he also has a special coin that he uses to transport himself to a secret cave headquarters, where he reveals to Lawson his newest invention, the Main Arc. Apparently a bigger version of the machine he used to get out of the pen, the Main Arc can transport people anywhere; he plans to use it to beam Superman out into space for eternity, into what he calls the "Empty Doom." 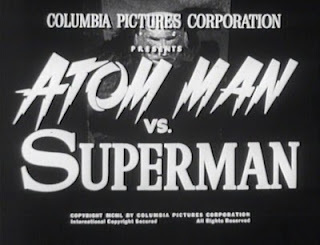 Luthor claims to have developed it with the help of his partner, Atom Man. Next day, Clark is reading that Lawson previously did a Human Fly act, when Jimmy runs up to say there's a human fly scaling a building. It's Lawson, of course. He robs a diamond merchant then uses a coin to disappear. At the scene, Jimmy peeks into the back of a TV truck and sees Lawson inside, pulling diamonds out of his pocket. Another thug happens by and knocks Jimmy out (the first time of many). He's dumped into the TV truck, which takes off. Lois sees it and tells Clark, then takes off with the cops to give chase. Clark changes to Superman and chases it down. The driver gets out and runs while guys in back call for help on the radio. As Superman is disabling truck driver, the truck blows up with Jimmy inside. Until Chapter 2, "Atom Man Appears," when we see that Jimmy and the thugs teleported to Luthor's secret cave headquarters. 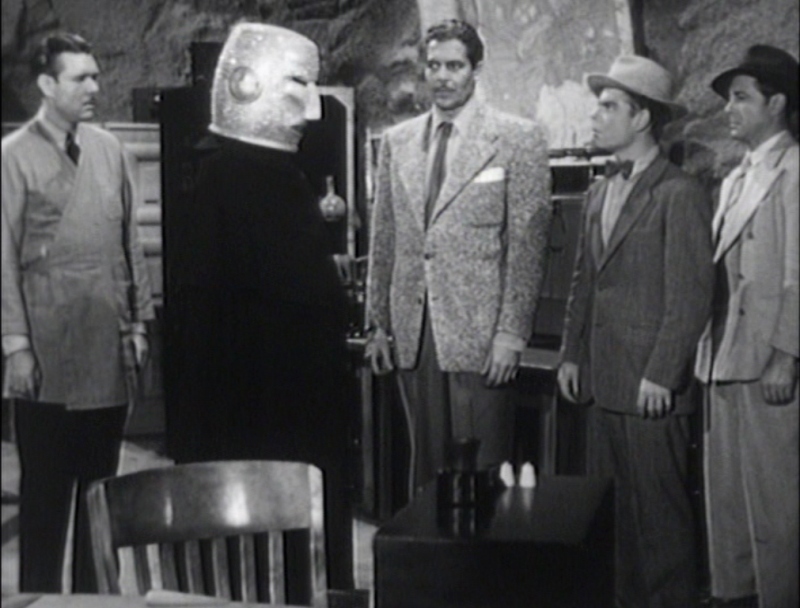 Atom Man appears, wearing a black robe and a soup tureen covered with glitter for a helmet. Boy, Atom Man's main helper on the left sure looks familiar. Atom Man explains the Main Arc again, then uses it on Jimmy, teleporting him to the Daily Planet to challenge Superman or something. 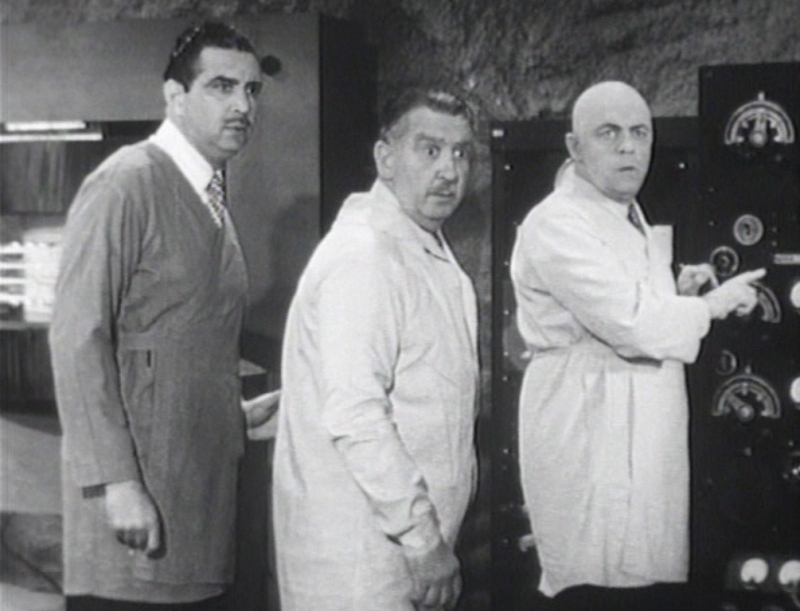 Luthor immediately radios his thugs in another TV truck to retrieve the special coin from Jimmy. Those guys look really familiar, too. 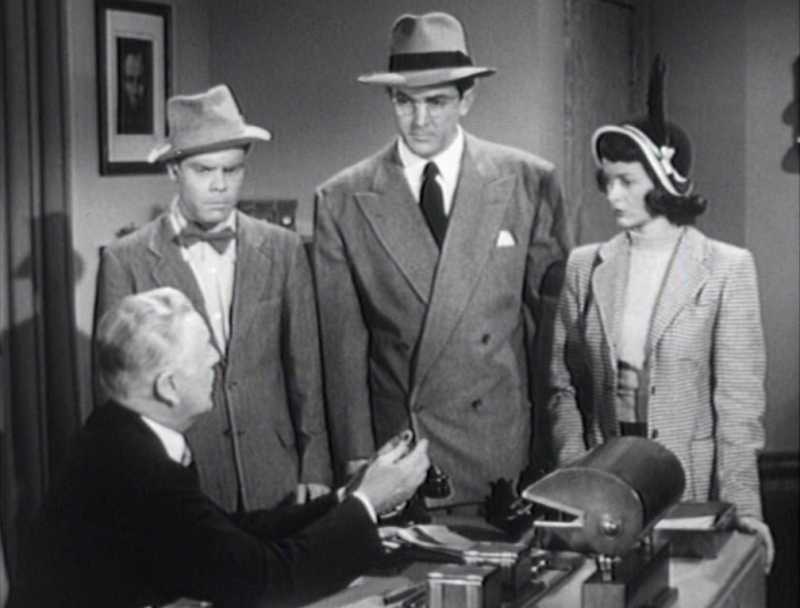 Perry tells Lois to store the coin in the safe, but she keeps it and leaves the building. We now interrupt the story in progress, so Superman can save the passengers on a burning cruise ship, while Perry White can't find a match to light his cigar (again). They were two of the Spider Lady's men. The guy in back is Rusty Westcoatt, who was also one of the bad guys in "Batman and Robin." The guy in front is Jack Ingram, better known as Anton, aka the Alpha half of the Fabulously Gay Duo (and of course, now I remember why Luthor's assistant Alber looks so familiar--he was FGD-Beta). The two thugs escape by jumping off the roof then teleporting away. And yeah, in case you're wondering, the rest of Luthor's gang also appeared in the previous serial, and some also were in "Batman and Robin." And the guy playing Killer Lawson was actually Kirk Alyn's stunt double in the first serial. But back to the action. 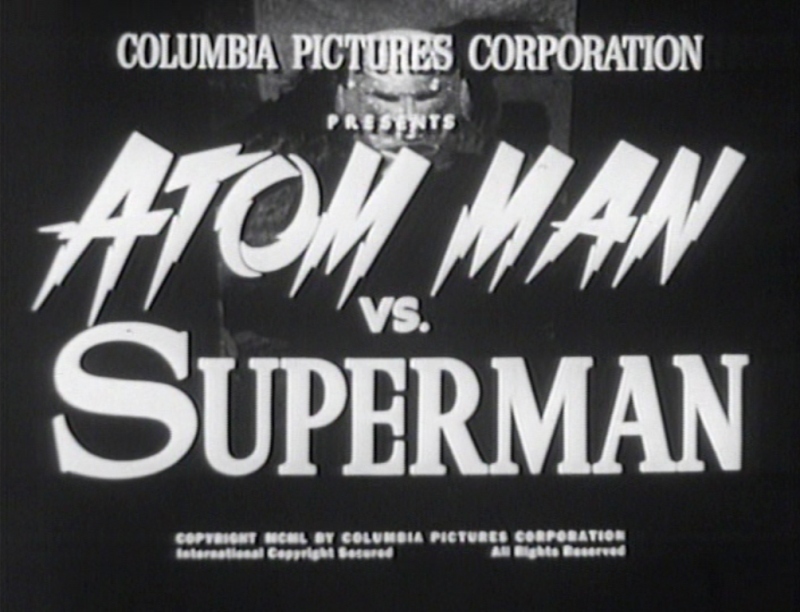 Atom Man's thugs are chasing Lois, who drives into a blast area to evade capture. Superman saves her from the blast, then captures the thugs chasing her. He keeps the coin, which Luthor is happy about, because he can use it to lure Superman into a trap. Not sure why Luthor doesn't just try to teleport Superman into his secret cave with the coin, but oh well. The thugs try to lure Clark Kent into an ambush, but as usual, Lois hijacks the call and falls into the trap. 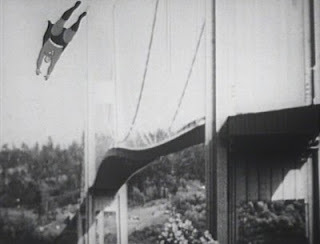 Superman tries to save her, but is struck by reused Reducer Ray footage from the first serial. It doesn't hurt him, but it slows him down. Lois gets pushed out a window and falls into Chapter 3, "Ablaze in the Sky." Superman saves Lois, while Jimmy notices a TV truck nearby. Given his recent history with another TV truck that looked exactly like this one, you'd think he'd be suspicious, but he never mentions it to anyone. Later, Luthor is paroled for helping the government with a new defense weapon, said to be a cross between radar and television. It's never really explained beyond that, although from the description, I picture one of those standard mad-scientist viewscreens that allows them to see stuff at a distance without a camera, and from the same angles that the cameraman on the show uses. Clark and Lois confront Luthor, who says he's going straight by investing in a TV studio, where he plans to use his "inventive genius." And of course, neither Clark nor Lois think about the TV truck that captured Jimmy in Chapter 1, because that would be, I don't know, intelligent. 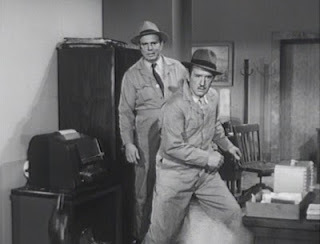 A couple more reporters arrive, but Clark spots a gun inside their camera and helps nab them. Luthor claims they must want to stop him from testifying or something, but Clark is suspicious. And well he should be, because Luthor is still just as crooked as ever. And in his business suit, he looks a lot like the future Business Luthor from John Byrne's Superman reboot. It's like he's channeling the future or something. So later, Superman stops a stock-footage oil well fire, because he's got to do something super every chapter, even if it has nothing to do with anything. And once that interlude is done, Clark, Lois, and Jimmy are sent upstate with the coin to have it analyzed by one Professor Stone. Only the bad guys have rigged one of the plane's engines to catch fire. Superman puts the fire out, though, so the plane can land safely. The thugs then race ahead and take the professor prisoner. They lock him in his own vault, then one of the thugs poses as Professor Stone so he can get the coin from the reporters. Chark sees through the ruse, though, and beats up three armed men, taking a bullet in the process. He passes it off by saying the bullet hit the coin in his pocket. He pulls out the coin and uses his super-thumb to dent it. When he shows it to Lois, one of the thugs grabs it and runs away. Clark chases after him, leaving Lois and Jimmy to keep the other thugs covered. At which point Professor Stone wakes up and uses special controls in his vault to seal his office door and roast the lab with jets of flame shooting out of the walls. Seriously, how hard-core paranoid is this guy that he's got special lab-destroying controls inside his vault?